Edith Wharton is one of my favorite writers. 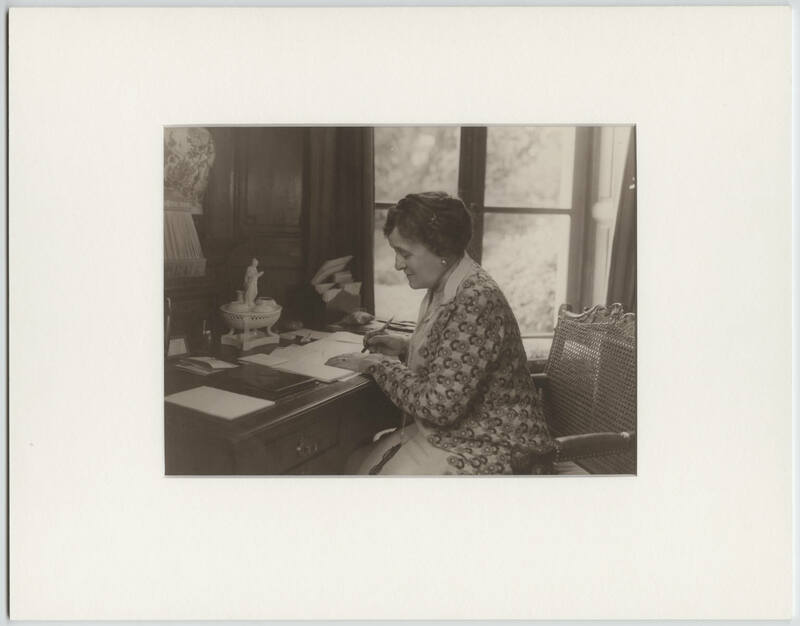 Her stories are timeless and elegant and if I had to be trapped somewhere with only one writer’s books for the rest of my life, I’d probably choose the complete works of Edith Wharton. I’ve been thinking about Edith a great deal lately because I’ve been having a lot of self-doubt about my writing for a number of reasons, few of them rational, all of them frustrating. The Internet is great but it’s also terrible because you know, all the time, what everyone else is doing and it’s easy to lose sight of writing itself as what matters most. It’s not hard to fall into the trap of losing confidence in what you do as a writer and/or trying to keep up with the literary Joneses by writing outside of your comfort zone to respond to the literary zeitgeiest. The older I get, the more I realize that while you can and should grow and challenge yourself as a writer, you can only be who you are. Sometimes, like many writers, I lose sight of that. I recently consoled myself with Age of Innocence and Wharton’s amazing short story, “Copy: A Dialogue.” Then I read Wharton’s The Writing of Fiction, a slim but rich volume of writing on writing. Wharton’s insights are sharp, timeless, and truly invaluable. I had no way of knowing but this book was exactly what I needed to remind me about what I should be doing with my writing. I particularly appreciated her counsel on novels that are focused and character driven. Edith totally set me straight. I also realized many of the conversations we have about contemporary letters are the same conversations that were had when the book was published in 1924. Wharton offers opinions on writing education, genre fiction, literary realism, “magazine stories,” the short story, novels, the work of the critic, character versus plot, readability (hello, Winterson), structure, the nature of art, and so much more. She’s unafraid to offer opinions on how things should be done and her arguments are always compelling. I don’t know why it took me so long to read this book but it is required reading. In addition to the valuable advice, the book is so elegant and witty. I laughed out loud over and over. Wharton demonstrates a fluent understanding of both her contemporaries and her predecessors and she offers strong opinions—Jane Austen, impeccable, Thomas Hardy, not so much. She really doesn’t care for Hardy. She holds the French and Russians in high esteem and the last chapter is dedicated to the charms of Proust. Balzac, Thackeray, George Eliot and Tolstoy should be read repeatedly. This book showed how the work of the fiction writer is not only to create fiction but also to consume fiction and be able to hold forth on matters of craft. Not for nothing, Edith was also an interior designer. Old girl could arrange a room. I could have easily transcribed the entire book but I selected the choicest bits (in a book where everything is choice) for your delectation. The distrust of technique and the fear of being unoriginal—both symptoms of a certain lack of creative abundance—are in truth leading to pure anarchy in fiction, and one is almost tempted to say that in certain schools formlessness is now regarded as the first condition of form. Another unsettling element in modern art is that common symptom of immaturity, the dread of doing what has been done before; for though one of the instincts of youth is imitation, another equally imperious, is that of fiercely guarding against it. One is sometimes tempted to think that the generation which has invented the ‘fiction course’ is getting the fiction it deserves. At any rate. it is fostering in its young writers the conviction that art is neither long nor arduous, and perhaps blinding them to the fact that notoriety and mediocrity are often interchangeable terms. As to experience, intellectual and moral, the creative imagination can make a little go a long way, provided it remains long enough in the mind and is sufficiently brooded upon. One good heart-break will furnish the poet with many songs and the novelist with a considerable number of novels. But they must have hearts that can break. Perhaps more failures than one is aware of are due to this particular lack of proportion between the powers of vision and expression. At any rate, it is the cause of some painful struggles and arid dissatisfactions; and the only remedy is resolutely to abandon the larger field for the smaller field, to narrow one’s vision to one’s pencil, and do the small thing closely and deeply rather than the big thing loosely and superficially. Form might perhaps, for present purposes, be defined as the order, in time and importance, in which the incidents of the narrative are grouped; and style as the way in which they are presented, not only in the narrower sense of language but also, and rather, as they are grasped and coloured by their medium, the narrator’s mind, and given back in his words. It is the quality of the medium which gives these incidents their quality; style, in this sense, is the most personal ingredient in the combination of things out of which any work of art is made. It is useless to box your reader’s ear unless you have a salamander to show him. If the heart of your little blaze is not animated by a living, moving something no shouting and shaking will fix the anecdote in your reader’s memory. The salamander stands for that fundamental significance that made the story worth telling. There are subjects trivial in appearance, and subjects trivial to the core; and the novelist ought to be able to discern at a glance between the two, and know in which case it is worth while to set about sinking his shaft. A good subject, then, must contain in itself something that sheds a light on our moral experience. If it is incapable of this expansion, this vital tradition, it remains, however showy a surface it presents, a mere irrelevant happening, a meaningless scrap of fact torn out of its context. The greater the improbability to be overcome the more studied must be the approach, the more perfectly maintained the air of naturalness, the easy assumption that things are always likely to happen in that way. It is never the genii who are unreal, but only their unconvinced historian’s description of them. Quiet iteration is far more racking than diversified assaults; the expected is more frightful than the unforeseen. They [protagonists] are his [the writer’s] in the sense of tending to do and say what he would do, or imagines he would do, in given circumstances, and being mere projections of his own personality they lack the substance and relief of the minor characters, whom he views coolly and objectively, in all their human weakness and inconsequence. The chief technical difference between the short story and the novel may therefore be summed up by saying that situation is the main concern of the short story, character of the novel; and it follows that the effect produced by the short story depends almost entirely on its form, or presentation. By all means let the writer of short stories reduce the technical trick to its minimum—as the cleverest actresses put on the least paint; but let him always bear in mind that the surviving minimum is the only bridge between the reader’s imagination and his. On this point repetition and insistence are excusable: the shorter the story, the more stripped of detail and “cleared for action,” the more it depends for its effect not only on the choice of what is kept when the superfluous has been jettisoned, but on the order in which these essentials are seth forth. Most beginners crowd into their work twice as much material of this sort as it needs. True economy consists in the drawing out of one’s subject of every drop of significance it can give, true expenditure in devoting time, meditation and patient labour to the process of extraction and representation. Of the short story, on the contrary, it might be said that the writer’s first care should be to know how to make a beginning. That an inadequate or unreal ending diminishes the short tale in value as much as the novel need hardly be added, since it is proved with depressing regularity by the machine-made “magazine story” to which one or the other half a dozen “standardized” endings is automatically adjusted at the four-thousand-five-hundredth word of whatsoever has been narrated. About no part of a novel should there be a clearer sense of inevitability than about its end; any hesitation, any failure to gather up all the threads, shows that the author has not let his subject mature in his mind. A novelist who does not know when his story is finished, but goes on stringing episode to episode after it is over, not only weakens the effect of the conclusion, but robs of significance all that has gone before. Narrative, with all its suppleness and variety, its range from great orchestral effects to the frail vibration of a single string, should furnish the substance of the novel; dialogue, that precious adjunct, should never be more than an adjunct, and one to be used as skillfully and sparingly as the drop of condiment which flavours a whole dish. The use of dialogue in fiction seems to be one of the few things about which a fairly definite rule may be laid down. It should be reserved for the culminating moments, and regarded as the spray into which the great wave of narrative breaks in curving toward the watcher on the shore. The object of dialogue is to gather up the loose strands of passion and emotion running through the tale; and the attempt to entangle these threads in desultory chatter about the weather or the village pump proves only that the narrator has not known how to do the necessary work of selection. All the novelist’s art is brought into play by such tests. His characters must talk as they would in reality, and yet everything not relevant to his tale must be eliminated. The length of a novel, more surely even than any of its other qualities, needs to be determined by the subject. The novelist should not concern himself beforehand with the abstract question of length, should not decide in advance whether he is going to write a long or a short novel; but in the act of composition he must never cease to bear in mind that one should aways be able to say of a novel: “It might have been longer,” never: “It need not have been so long.” Length, naturally, is not so much a matter of pages as of the mass and quality of what they contain. It is obvious that a mediocre book is always too long, and that a great one usually seems too short. General rules in art are useful chiefly as a lamp in a mine, or a handrail down a black stairway; they are necessary for the sake of the guidance they give, but it is a mistake, once they are formulated, to be too much in awe of them. If no art can be quite pent-up in the rules deduced from it, neither can it fully realize itself unless those who practice it attempt to take its measure and reason out its processes.